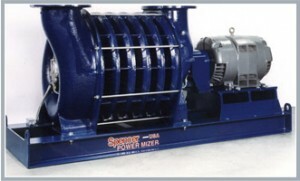 Industrial Fans & Blowers – Midwest Air Equipment Co.
Spencer has many blower types from single stage centrifugal and regenerative models to multistage centrifugals with fabricated or cast construction. Power Mizer® blowers with cast iron and aluminum components have very high operating efficiency suited for continuous-duty service, while fabricated blowers of carbon steel allow substitution of specialized metals for precise resistance to abrasion, corrosion or extreme temperatures. Overall performance maximums: 50,000 ICFM, 20 PSIG pressure, 15″ Hg vacuum.